Colombia, the late 1970s. Pablo Escobar is an already-notorious smuggler and fence, selling stolen electrical goods and keeping one step ahead of the police. A Chilean chemist nicknamed "Cockroach" introduces him to a method for creating cocaine in small, easy-to-hide labs. Escobar starts selling the drug and smuggling it into the United States, most successfully via ship into California and Florida. Soon he is making tens of millions of dollars per month. Alarmed, the US Drug Enforcement Agency sets up an office in Bogotá and sends in agent Steve Murphy with one mission: to bring down Escobar and, helped by the Colombian government, destroy his organisation. Narcos is an original drama series which, in its first season, covers and the rise and most successful years of Pablo Escobar, one of the most notorious drug traffickers in history. "Don Pablo" made billions of dollars off the back of the trade, so much he couldn't even spend it or even realistically launder it (resulting in him burying vast amounts of it). In a career spanning fifteen years, including the entire 1980s, he became the most famous criminal in the world and occupied staggering resources from multiple governments in an attempt to bring him to justice. At one point he was responsible for 80% of the world's cocaine traffic and is blamed with the explosive rise in the popularity of the drug in the USA in the 1980s, with devastating results for communities and law enforcement. Escobar was also a man of the people, beloved for the vast amounts of money he spent on social housing, schools and hospitals in Colombia. He even ran for office before his drug convictions caught up with him. Always willing to use violence, assassination and intimidation, in his later years he became far more ruthless and willing to compromise his Robin Hood or "bandit king" image to further his goals and power. In turn, the Colombian government became increasingly willing to use overwhelming police and military force to try to hunt him down. Narcos is an unusual series because it isn't strictly a drama series but it isn't quite a docudrama either. Like a docudrama it makes use of voiceovers, contemporary footage and news reports to illustrate the story, but it is all framed within the confines of a drama. So there's no talking heads of the real people involved, but there are photographs and news interviews with the actual real people before we cut away to the actors playing those roles. It's all rather odd and shouldn't really work, but after a while it becomes more familiar and starts working better. At the heart of the series is Escobar, played by Wagner Moura. Moura gives a great performance, reproducing Escobar's mix of ruthlessness and charm with skill (although those with a detailed working knowledge of Spanish may find his Mexican accent somewhat incongruous). Boyd Holbrook is okay as Steve Murphy, but he plays a pretty standard straight-up American guy without much in the way of a personality. His growing addiction to the game of catching Escobar, even to the detriment of his marriage, provides a possibly interesting subplot, but the show never really engages with it. Pedro Pascal (late of Game of Thrones, where he played Oberyn Martell) is more engaging as DEA Agent Javier Peña, whose local connections and knowledge play a key role in helping bring down Escobar. Raúl Méndez also gives a great performance as César Gaviria, the reluctant President of Colombia who ends up leading the political battle against Escobar. Maurice Compte also gives a great, intense performance as Horacio Carrillo, the police chief tasked with taking the war to Escobar and whose position is constantly under threat because of his competence. Whether you like Narcos or not will depend on if you tune in to how the show is structured and paced. Episodes of the show can span months or even years, with months passing between each episode. Sometimes so much is going on that a voiceover has to cut in to explain what's going on. Major players show up out of nowhere with, again, the voiceover (somewhat apologetically) required to explain who they are and how they fit into the narrative. The story can often feel like it is proceeding in fits and starts, rather than the smooth, slowly-unfolding story of something like The Wire (Narcos also fails to really address the human-level suffering brought about by the drug trade, a couple of shots of coke addicts on the streets of Miami aside). Even more confusingly, Steve Murphy only joined the fight in Colombia towards the end of the 1980s, so the show has to introduce him and then roll back ten years to show Escobar's rise. In the early episodes this can lead to scenes featuring Murphy and the DEA taking on the drug cartel in the late 1980s and us flashing back years to what Escobar was doing back in the day. Escobar's children are also portrayed fairly anachronistically, with the final episode (taking place in 1992) showing his son and daughter as being well under 10, when in fact his son was 15 years old. If you can adapt to the mindset of the show, however, there is much to enjoy. The performances are excellent and the narrative, if not exactly chronologically accurate, does get across the general story of what happened. More than once this viewer was so surprised by a storyline that I had to look up the real history online to see if these events really happened (and yes, they did). The stop-start nature of the show can be a little bit distracting, but the last couple of episodes unfold over much more focused periods of time, culminating in the infamous police and army siege of Escobar's ostensible prison (but really his prison and stronghold), the Cathedral. The season finale, which unfolds over just one night, is easily the best episode of the season and allows us to get right under the skin of all the players involved in the tense stand-off. It bodes well for Season 2, which spans a period of only 18 months rather than almost 20 years. 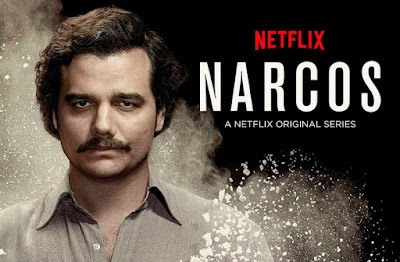 The first season of Narcos (****) is a fascinating study of corruption, greed, vainglory and power, although at a remove from the characters which prevents it from resonating in the same way as say The Wire or Breaking Bad. But as a concise summary of the life of one of the 20th Century's most notorious criminals, it is very effective. It is available now, along with a second and third season, on Netflix. A fourth season, which acts as an effective reboot by rewinding to 1970s Mexico, is due for release this autumn.